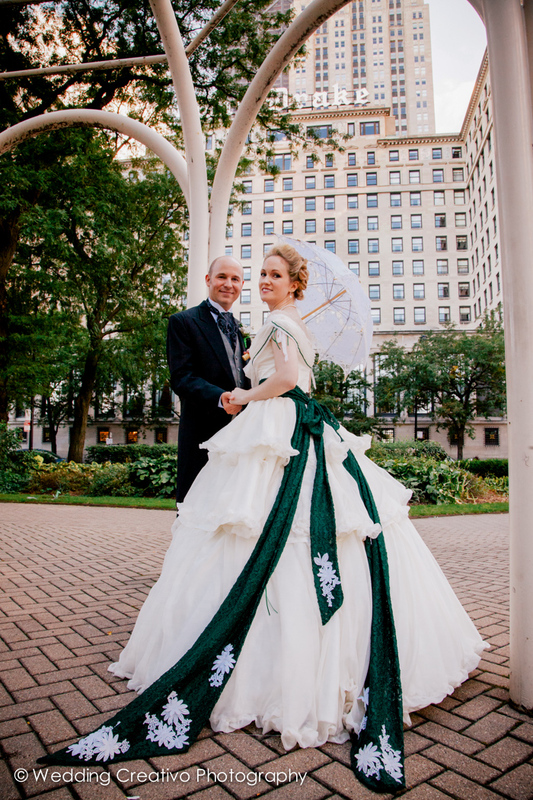 Terah and Ross celebrated their emerald green and gold wedding at Unity Lutheran Church and the Fortnightly Club in Chicago. 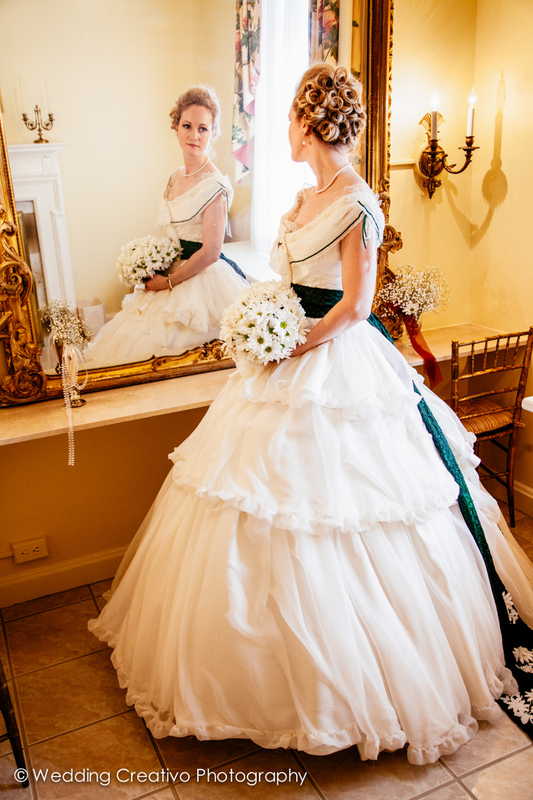 The bride is a historian and created an authentic Victorian era theme wedding....down to making her own dress! 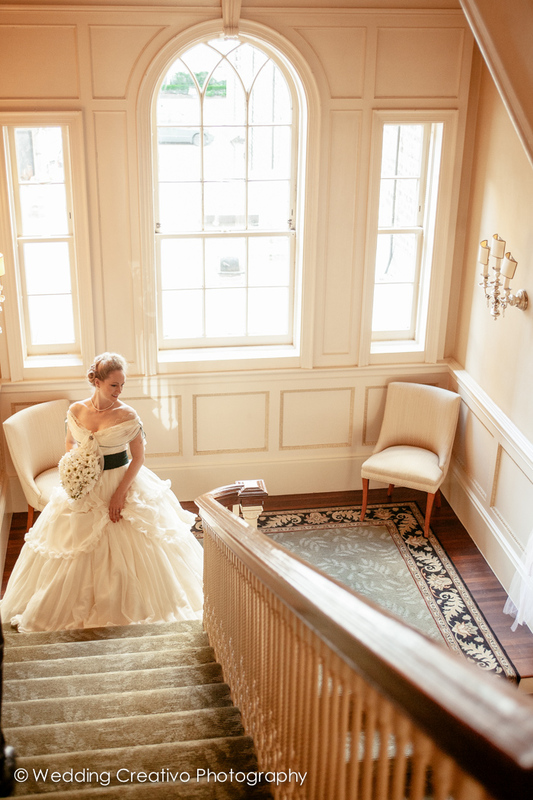 It was modeled off of a 19th century Civil War era design. 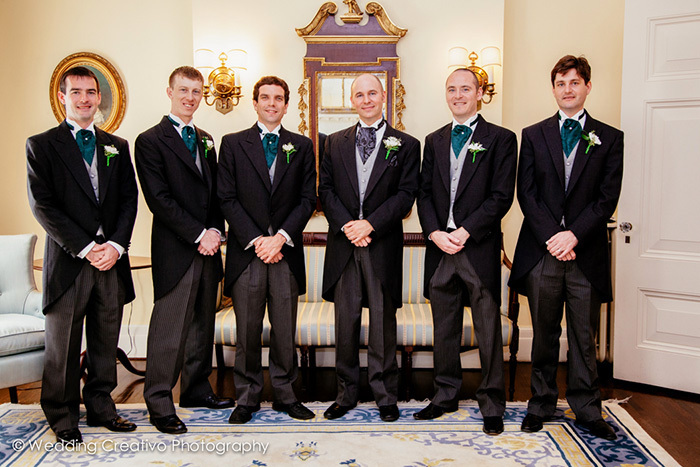 The groomsmen's suits were also period inspired with old fashioned ascotts instead of modern ties. 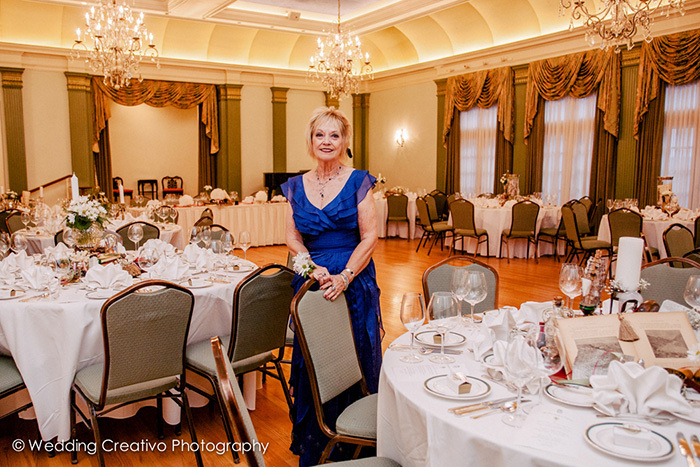 The bride's mother Linda also helped a great deal by elaborately designing the reception table centerpieces. 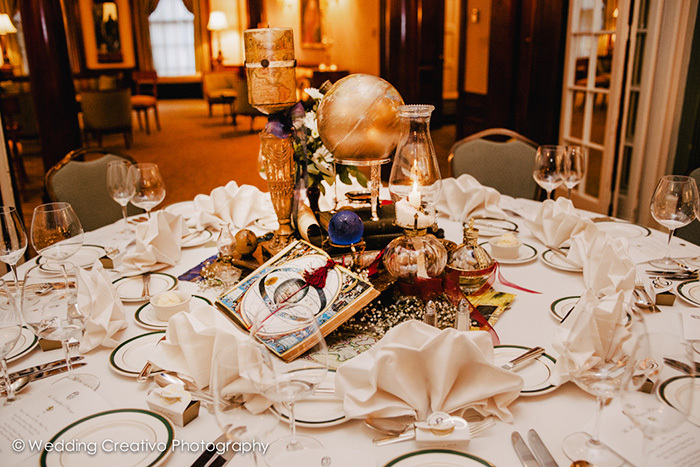 Each table had a different traditional scholastic subject theme and was decorated using a varieity of antiques and vintage pieces such as inkwells, maps, globes, books, and old photographs. 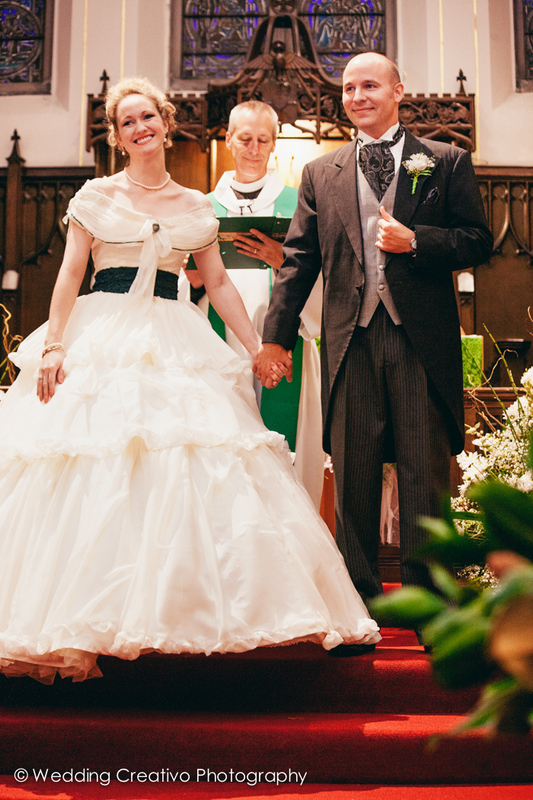 Overall, the style of the wedding reflected both Terah and Ross's professional careers in academia. Terah and Linda also made the invitations and programs, and many other details. All in all it was truly an exceptional D.I.Y. wedding, We will always look back on this as all-time favorite for us, not only for the amazing details, but primarily because Terah and Ross were such wonderful and kind couple, an absolute pleasure to get to know, and we were so honored to be included on their memorable day. 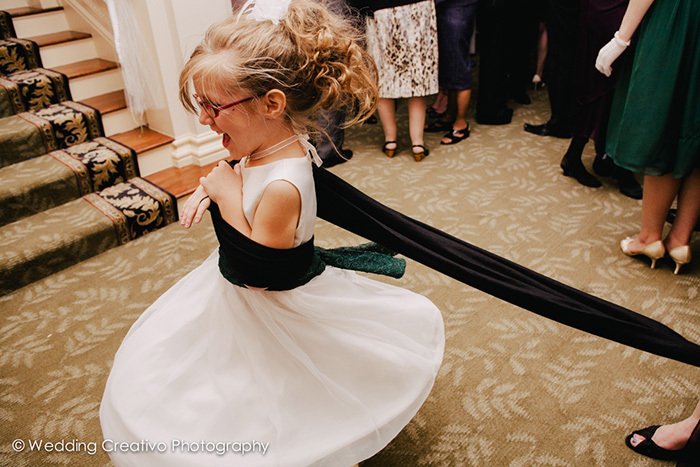 The little ones that carry rings and flower baskets at weddings are usually pretty aware big importance of the wedding day, and kids always create spontaneous and unique magic moments. 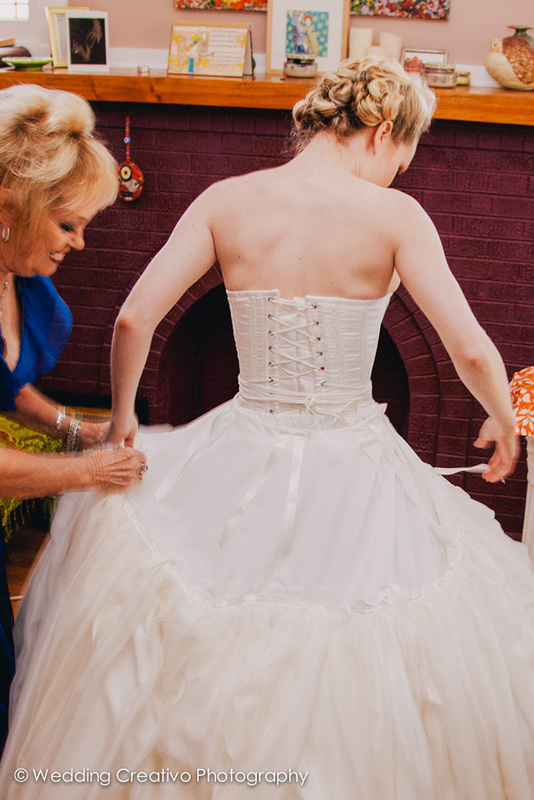 To help them feel more comfortable and confident, it is nice to have a parent come a little early with them to the ceremony so they can "practice" their job before walking down the aisle in front of all those people! Sometimes this does not work at all when kids are extremely terrified, but frequently kids fare better with just getting an opportunity to feel more familiar in uncharted territory. 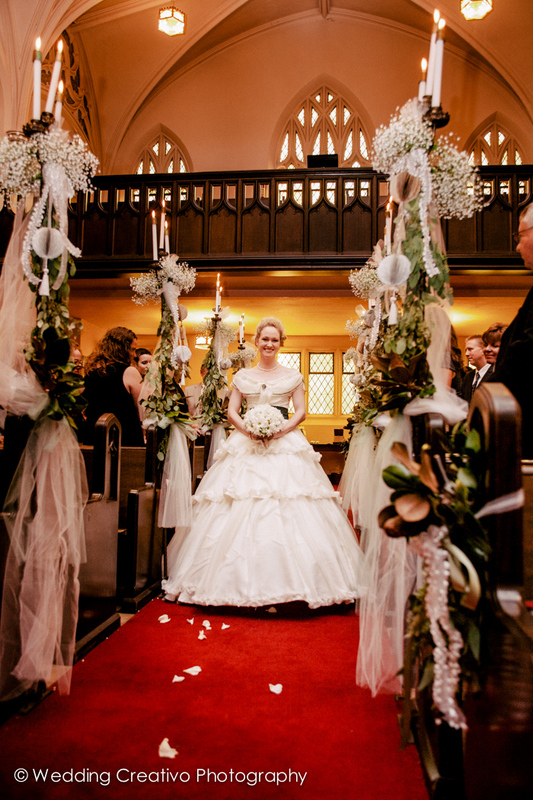 Even a brief run up and down the aisle can be a big help to settle their nervousness. 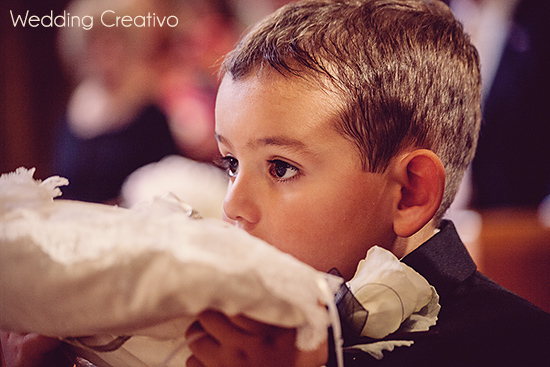 This little guy took his job as ring bearer pretty seriously and is shown here eagerly awaiting his cue to present the all important wedding rings. So adorable! 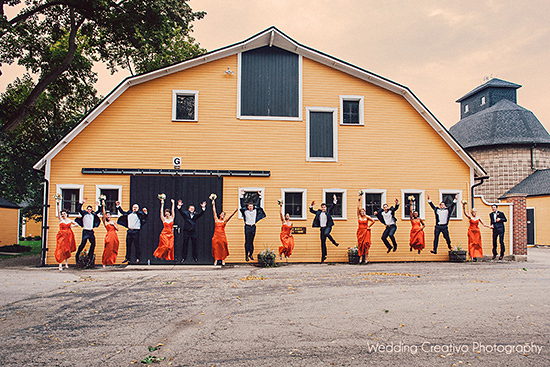 The wedding party "jump" is a classic fun portrait to do, especially with a larger wedding party lined up and jumping in perfect timing. We worked with the monochromatic details to give this portrait a bit more creative flair for this wedding party jump portrait. It worked out nicely with the orange barn, golden sunest sky, and burnt orange bridesmaid dresses at Jenny and Patrick's wedding in Glen Ellyn over the weekend. Looking for a different idea for the "something blue" item for your wedding? Consider a stunning statement piece with a sapphire or other blue gem cuff bracelet. Tegan and Var had these fabulous fall candy apples set on the tables for their guest favors. What a fun treat and nice addition to golden toned autumn weddings. 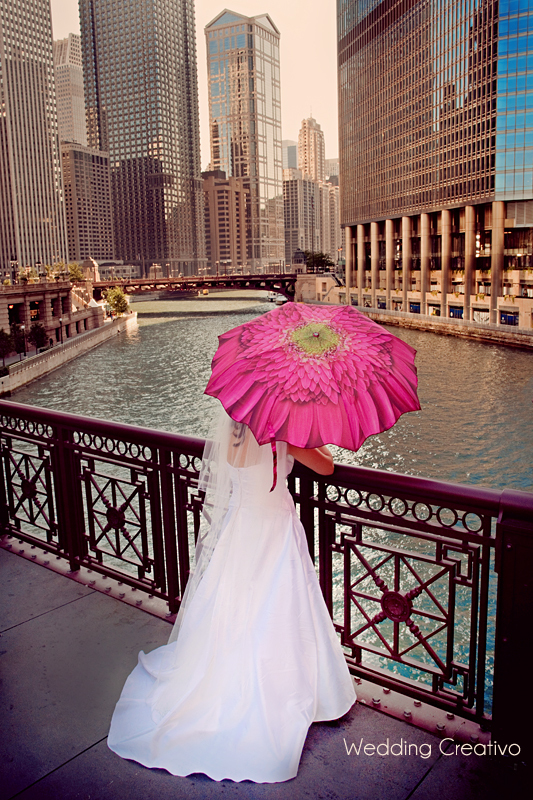 Parasols are popping up in cute styles of paper, prints and, of course, traditional lace at summer 2013 weddings. 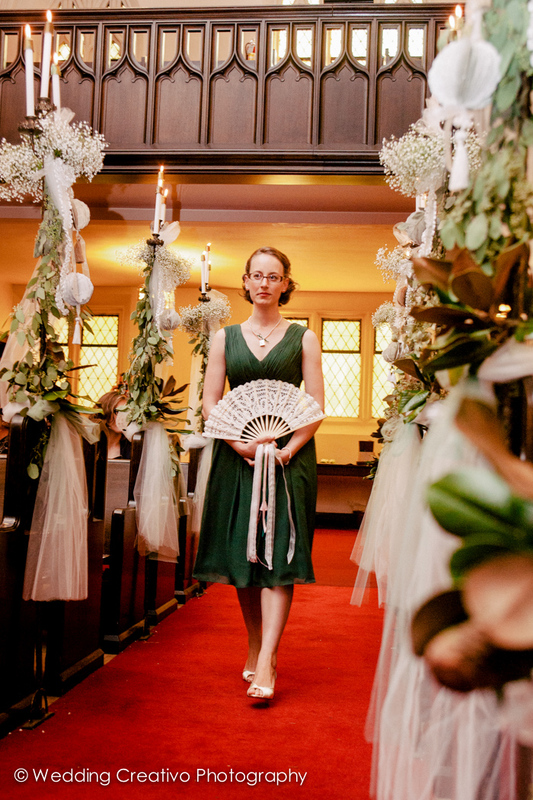 Parasols and statement umbrellas always play a part in weddings every year, but new versions of paper parasols in this seasons hot coral and green colors, as well as cute printed statement umbrellas and parasols are trending this summer. 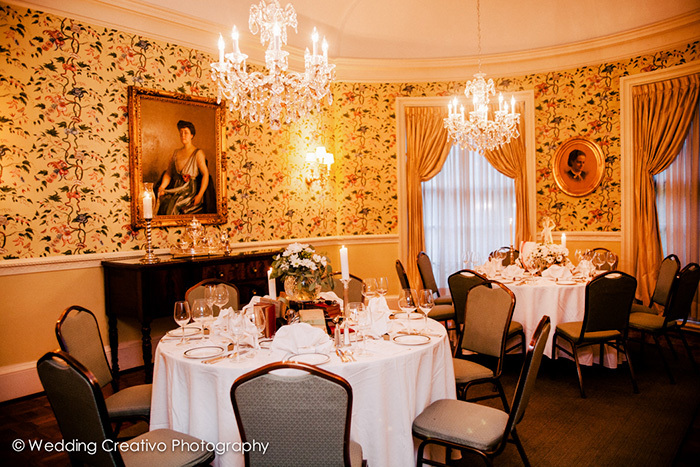 With such a large Polish population, Chicago is fortunate to have dozens of wonderful Polish bakeries throughout the city and suburbs, so it is not hard at all to include these popular traditional treats at your wedding. These delicious sweets pictured below were made by Central Continental Bakery in Mt. Prospect, IL. 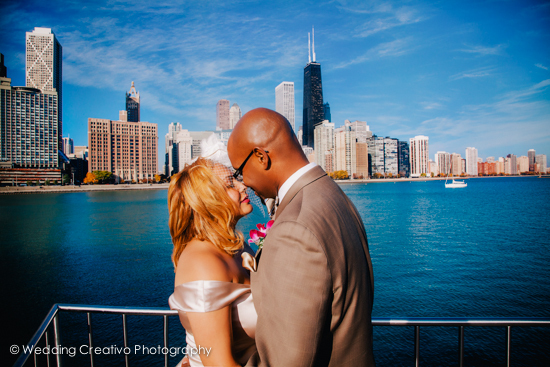 Chicago wedding photographers Wedding Creativo Photography is located downtown, so of course many of our couples love to go to sites with skyline views for their portraits. 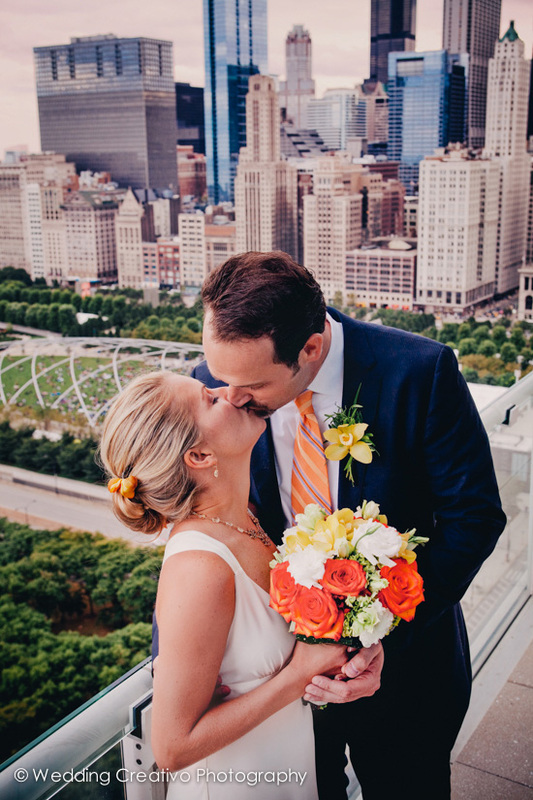 Here are some of our recent favorite wedding pictures with beautiful Chicago skyline views. 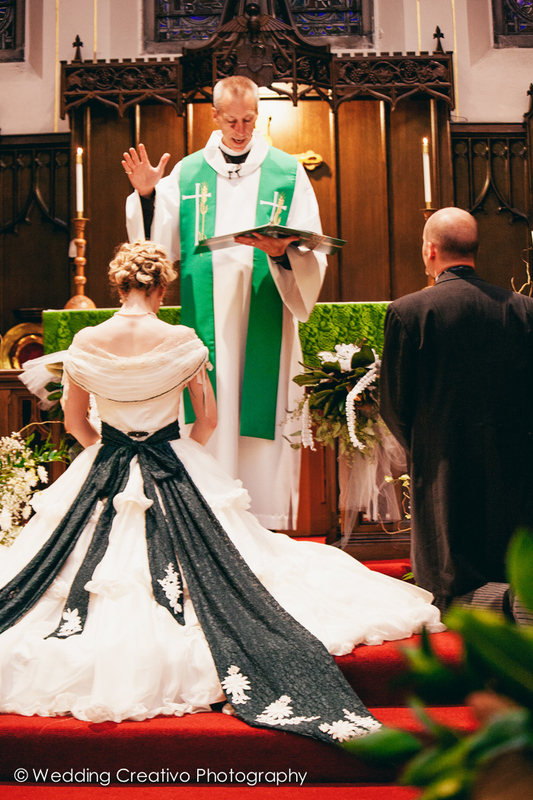 Yes indeed, having some kind of tote bag or kit for little "emergencies" on your wedding day is always a great idea, and be sure to have items that are helpful for ladies and gentlemen. However, it is your wedding day after all, and there is no rule that says the emergency bag has to be strictly utilitarian. 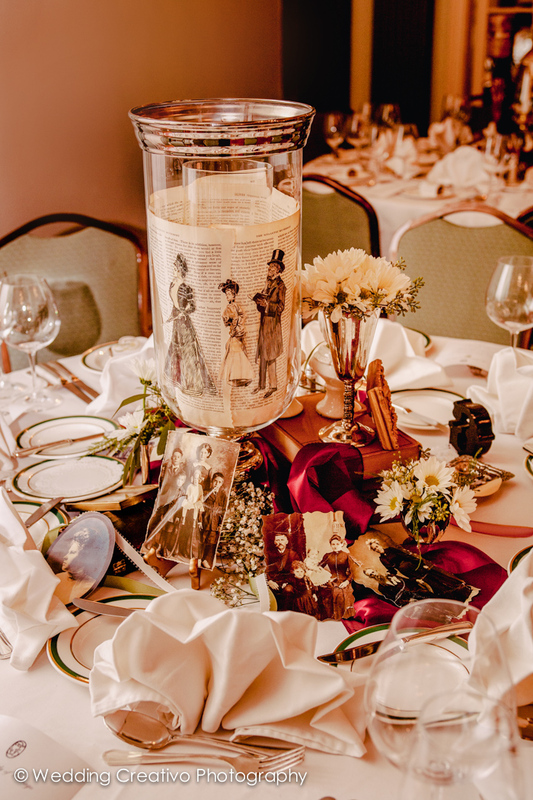 Along with the bandages and safety pins, you can add a little glamour with small luxury items for touch ups, perfume or luxury treats or snacks. Even if it is just the tote bag or toiletries bag, you can make them extra special...and you might even hope that you get a blister to have a good reason break out your stylish tote or sparkly flats. 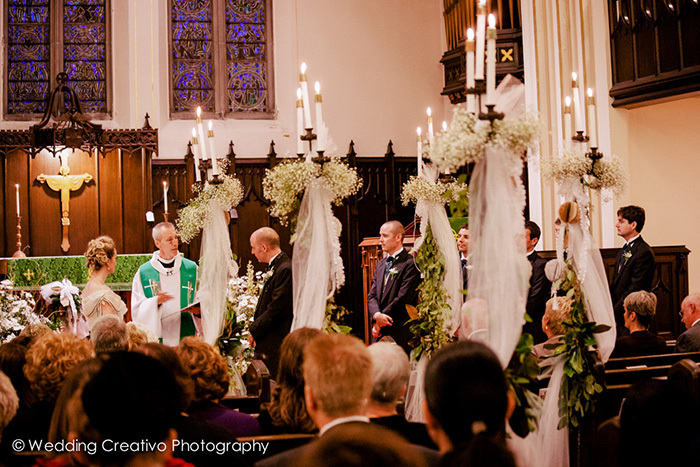 In seasonal cities like Chicago weddings don't stop in fall, winter and spring...you just need a spectacular over coat. Here are some recent winter coat styles we think would be great for winter weddings. 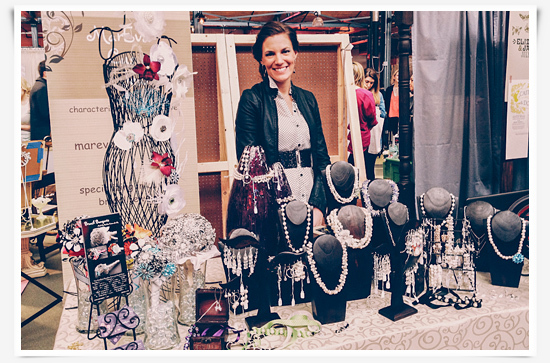 We had a wonderful time at Indie Wed on Saturday, and were inspired hearing all of the creative plans couples are making for their 2013 and 2014 weddings. 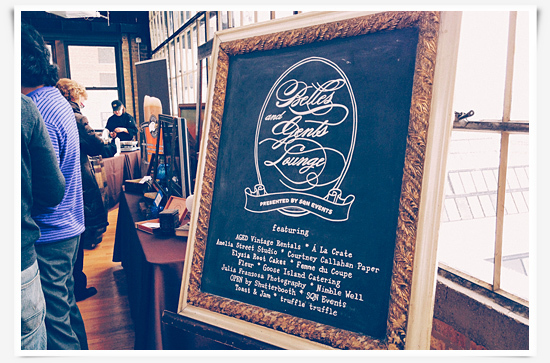 Indie Wed is THE event for couples looking for unique wedding ideas and professionals, and we were honored to participate. Thanks to everyone who came by our booth to say hello, and also a big thanks to our associates Amanda and Kevin for doing such a wonderful job. We are so fortunate to have such wonderful people, couples and professionals, to make our world go round. 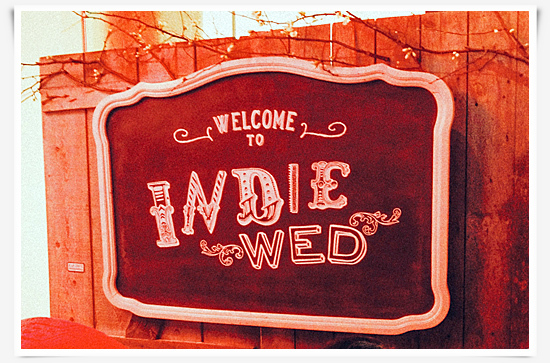 Here are some of our favorite highlights from Indie Wed. There are also lots more pictures on our facebook page. 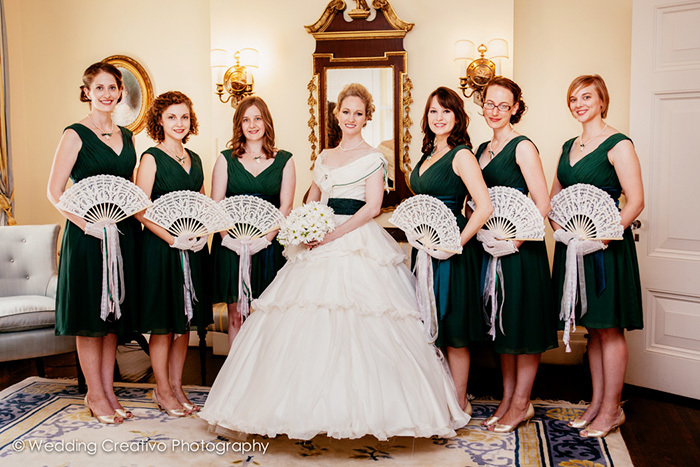 Brides and bridesmaids, can we please see some Mohop shoes on your feet? Folks in Chicago make these kicks! 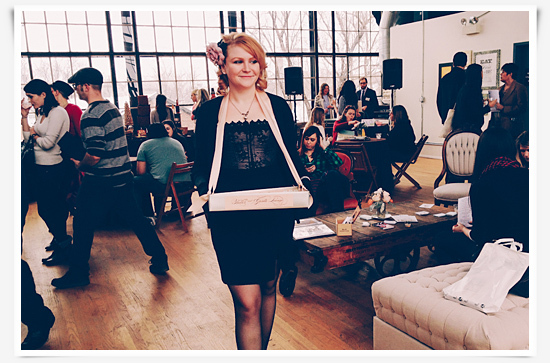 The Caterist, a new catering company based in Evanston, was in the booth next to ours. They saw us drooling, had mercy on us, and gave us some treats. They were quite tasty and we were impressed! We liked this band called We, Unity Candle. They were fun, but as serious audiophiles we were mostly impressed with their abilities to manage quality live sound while rocking the house. 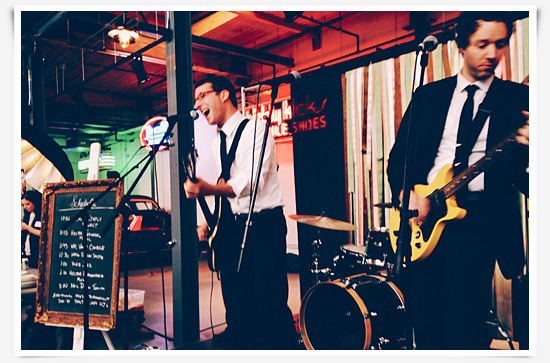 We see a lot of bands that mistake loud distorted volume for rocking, and these guys did NOT do that, bravo! 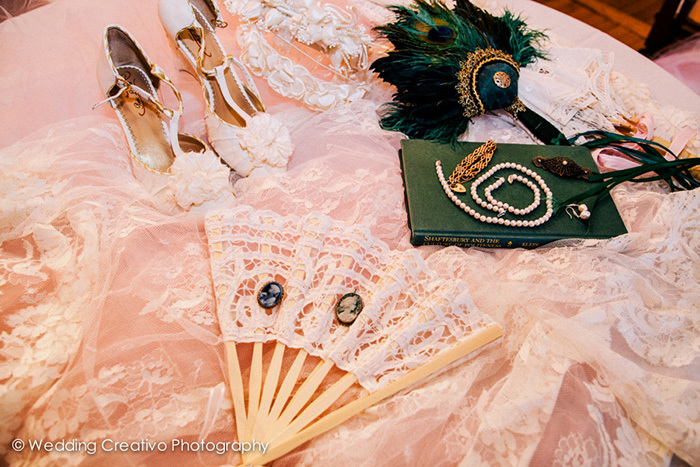 MarEva's custom designed jewelry and brooch bouquets caught our eye. We were easily lured in by so many beautiful shiny sparkly things. Inspired by blush and pastel colors of spring, this two-sided Save-the-Date postcard with pink and cream iris flowers is a great way to set the tone for a romantic spring wedding. Wedding Creativo offers customized Save-the-Date cards with select engagement packages, or anyone may order custom designed cards from us by request. 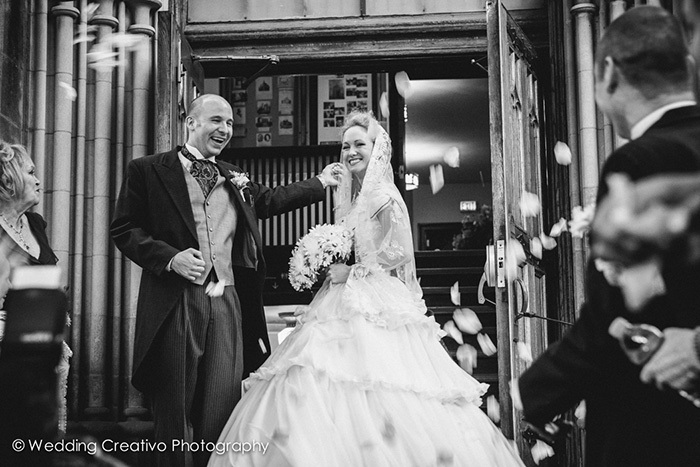 For more information please contact Sarah at info@weddingcreativo.com. Around the winter holidays is annually when engagement season is in full bloom, although any time of year is a good time to propose. As we look towards Valentines Day next month, one of the biggest engagement days each year, we're inspired to do a new round up of the latest engagement rings for 2013. A few unique trends we're seeing are rose gold bands, emerald green stones and yellow diamonds. Also, classic cuts and vintage style engagement rings are forever fashionable. 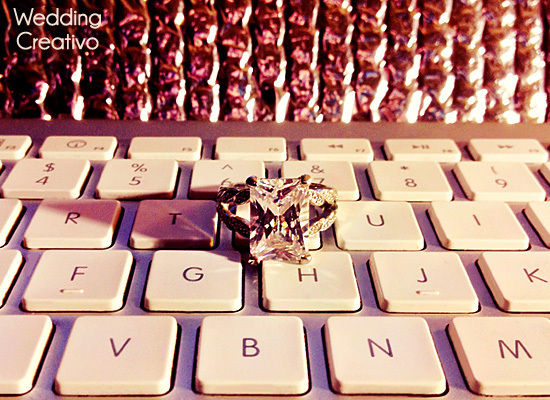 With thousands of wedding blogs around the world there is literally limitless inspiration and information for wedding planning. For the Chicago area, we are fortunate to have so many creative and knowledgeable wedding professionals who also have fantastic blogs. 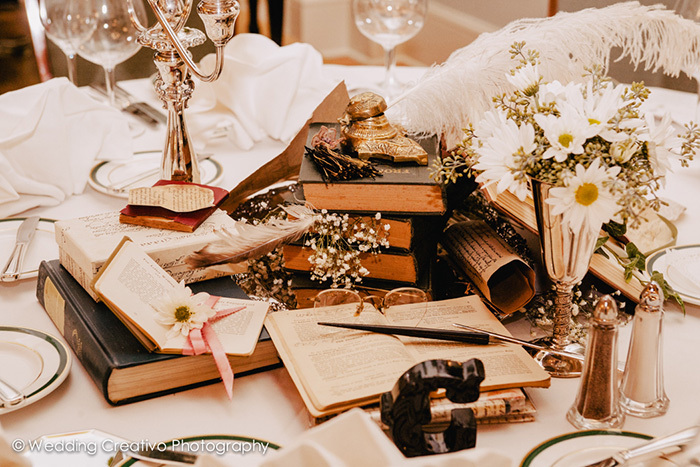 We find the advice and tips found on event professionals blogs to be more realistic, filled with a lot more original ideas, and frankly, far more diverse than what we see on the nationally-known wedding blogs. Wearing a beautiful silk, velvet or other luxurious robe while you are getting ready on your wedding morning can give your big day an extra special start. We've rounded up a new collection of fantastic dressing robes for brides featuring romantic designs by Jenny Packham, Plumb Pretty Sugar, and Rosamosario. When I set up our Polaroid cameras and props at Annmarie and Kirk's wedding, I literally had FIVE SECONDS to take a picture of the table before all the kids attacked! Which is proof positive that instant cameras = instant hit at weddings, especially with kids. It is fun to see the "wow" look on the faces of children when the print comes out of the camera, and also adults who remember using Polaroid cameras from back in the day. We offer our collection of Polaroid cameras as a fun reception activity as an optional add on to our regular wedding photography coverage. Whether you collect perfumes, or are searching for a special scent just for your wedding day, here are a few tips for your fragrance selection and post-wedding storage. 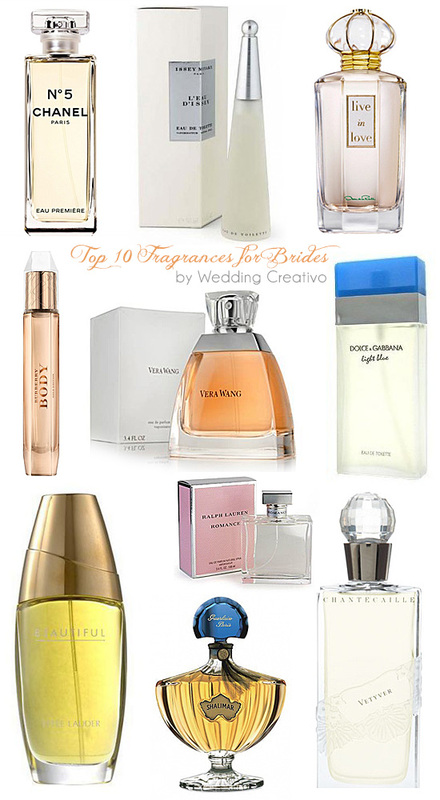 All of these wedding fragrances are equally wonderful, and listed alphabetically. The right choice is the one that best represents your personal style and scent preference. 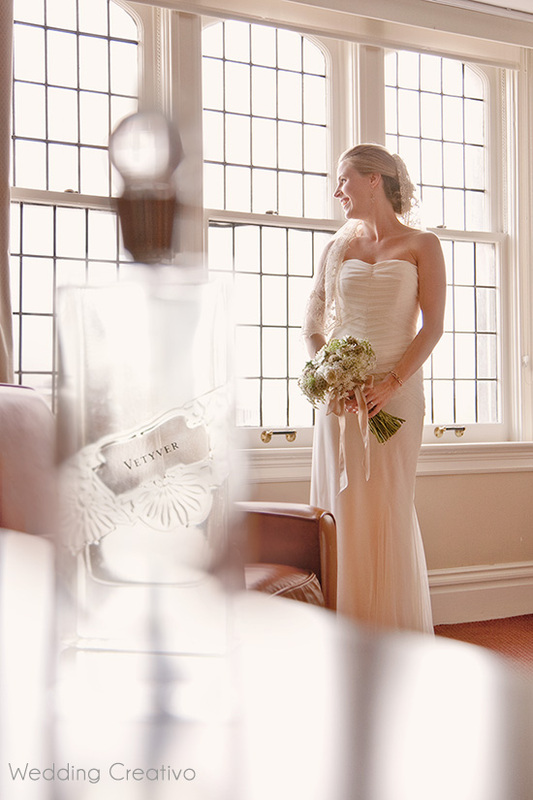 After the wedding, many women keep their perfume bottles in the bathroom, which is actually not the ideal place for storage. The steam from the shower and inherent humidity of a typical home bathroom affects both the aroma and color of perfume. It is optimal to keep them in a in a place without direct sunlight and relatively low humidity, such as your bedroom dresser or wardrobe closet. If you rather show off your pretty bottles, perhaps display them on a tray or in a basket that can easily be moved to a closet shelf on occasion, such as when you are away on vacation or on a long weekend. This will help to extend the life and vibrancy of your favorite fragrances. 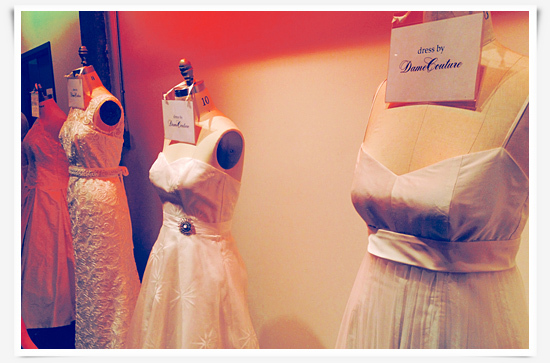 On the runways this week, we've noticed a trend in the 2013 Spring Bridal collections among various wedding dress designers....vintage Hollywood glam! 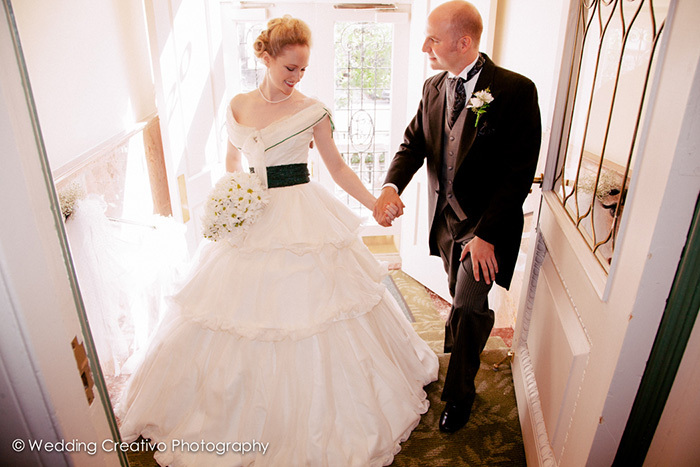 In the last couple of years we've been working with more couples having weekday elopements. Inspired by these couples, we're trying different ideas to blow away the old stereotype of "courthouse" weddings and elopements, and revolutionize this whole concept. These kinds of weddings are not for everyone, but for those who do, we have been working on making the experience a lot more special, creative and fun. We had a blast recently with Susan and Joseph, and this sweet ride, the Italian Fiat 500! 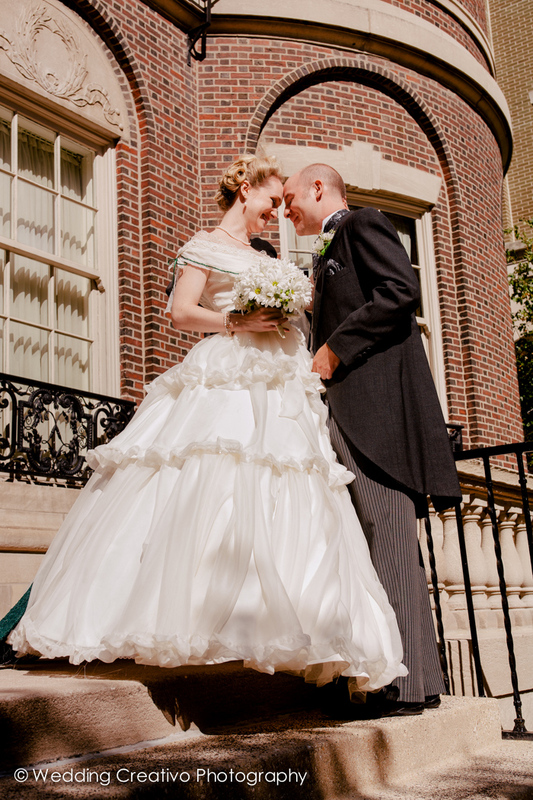 We'll post more from this elopement soon, but we just love this shot, and it epitomizes our quest at Wedding Creativo Photography to inspire couples who are eloping to think outside-the-box and beyond the City Hall basement court office....and have a lot more fun! 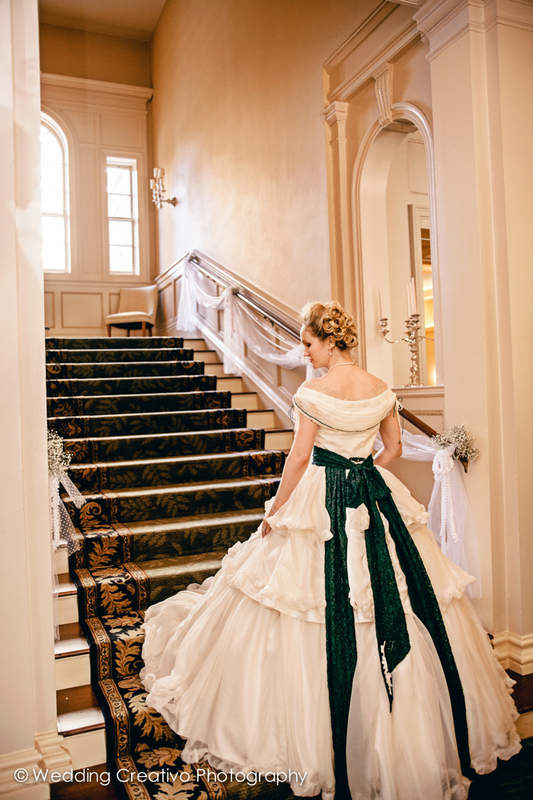 In addition to covering traditional marriage court weekday weddings, we have developed our own elopement packages that include photography and an officiant, as well as creative elopement planning. Interested? Email us for more info. Inspired by Pantone's Fashion Color Report Fall 2012, we assembled this inspiration board for wedding colors and bridesmaids dresses of this season's trends. In particular we hope to see more tangerine orange, ultramarine green, honey gold, and french roast brown at weddings this fall.